Since my toddler has started talking he has been making me laugh, constantly. I try to remember all the funny things he says, but it is hard. I tell myself to remember that one, and I will write it down later. But when later comes I can’t remember what he said. Sometimes it is just that he says a phrase that I say, or someone else always says and it is so cute coming out of his mouth. Lately he says “hey, what’s da big idea?” from Donald Duck. The way he interacts with Baby Sid is so cute that I wish we were filming him at all times! Last night Ian was taking a bath (our house is very small) and Baby Sid was in the living room in his swing with Dad. Baby Sid hadn’t felt well and started crying. Ian yells from the bathroom “It’s OK Baby Sid, I just takin’ a bath….Don’t worry Baby Sid, Mama’s commin’…..Shhh, it’s OK Baby Sid, I almost der.” And other things of that nature, even though Baby Sid had stopped crying and was just making noises now. I have been putting up a few of our conversations up on my Facebook page and I hope to put some up here as well. He had us crackin’ up all weekend. It was really nice that my husband finally had a weekend off and the kids and I didn’t have any plans. We all spent the whole weekend at home. 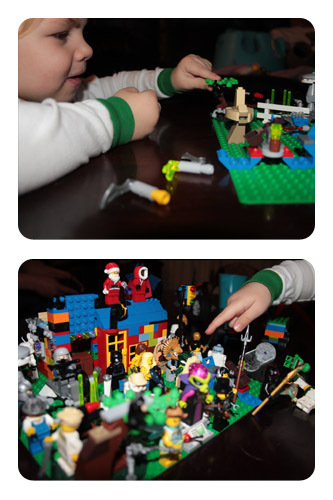 We did a lot of building with Legos. **I don’t actually make the Chicken Cordon Blu, I buy it from the meat counter at our local Fred Meyer Store. I just use this recipe for the sauce. Categories: Meal Plan Monday, Motherhood | Tags: cooking, Lego, Meal Plan, Meal Plan Monday, Meal Planning, Menu Plan, Menu Plan Monday, Menu Planning, recipes, what to cook | Permalink. Your menu looks really good. I’m a bit taken with the Autumn Sausage Casserole but I know my picky crew wouldn’t go for it.